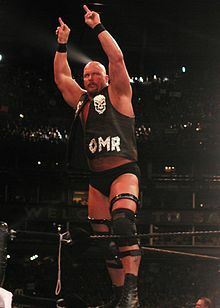 Stone Cold Steve Austin, a key figure in the Attitude Era. The Attitude Era was a period in the World Wrestling Federation and professional wrestling history. It began with the Monday Night Wars and reached its end with the conclusion of the Wars in 2001. The Attitude Era professional, like the 1980s wrestling boom, made wrestling more popular in the United States from the late 1990s to early 2000s. Television ratings and pay-per-view buy-rates reached their highest points. Unlike the more traditional WWF programming, the Attitude Era tried to attract the young adult demographic. It did this by transforming the product into a more controversial "shock value" form of entertainment similar to the "Trash TV" genre popularized in the 1990s. February 24, 1997 - Extreme Championship Wrestling "invades" Monday Night Raw. March 10, 1997 - Monday Night Raw officially became Raw is War; the show introduced the TitanTron, the pyro openings and the Raw is War banners over the ring. September 22, 1997 - During this episode of Raw, Vince McMahon receives his first Stone Cold Stunner from Stone Cold Steve Austin. October 5, 1997 - The Hell in a Cell match was first introduced at In Your House: Badd Blood at the Kiel Center in St. Louis, Missouri. It featured The Undertaker and Shawn Michaels. In that match, the door was unlocked to allow the removal of an injured cameraman. This led to Shawn Michaels and The Undertaker fighting outside the cell, eventually climbing the structure and fighting on top of the cell. The fighting taking place outside of the Cell led to the first fall from the cell, when Shawn Michaels, hanging from the edge of the structure, had his hands stepped on by The Undertaker and fell from the structure, crashing into the table below. Also in that match, the goal of no interference was not achieved when The Undertaker's younger brother Kane made his debut, ripping the door off of the cage and giving a Tombstone piledriver to The Undertaker, allowing Michaels to crawl and pin Undertaker. November 9, 1997 - at the 1997 Survivor Series, with the match between Shawn Michaels and WWF Champion Bret "The Hitman" Hart for the WWF Title, when Michaels locked Bret Hart into Bret's own submission, The Sharpshooter, Vince McMahon, who was at ringside, order referee Earl Hebner to ring the bell. The post-match events came under fire of controversy the fact that in the storyline, Bret did not tap out when locked into submission and was not supposed to lose at all. Due to the fact it took place in Montreal, Canada, the event has been dubbed as The Montreal Screwjob. This was also known to be Bret Hart's last match in the WWF. December 8, 1997 – During this episode of Raw, Stone Cold Steve Austin knocks WWF Chairman Vince McMahon off the ring, thus entering the Austin/McMahon saga. March 30, 1998 – With Shawn Michaels out because of back injury, Triple H calls himself the leader of DX, which he adds the New Age Outlaws and X-Pac to the group. April 6, 1998: In this episode of Raw, DX goes to "war" with WCW when they invaded a WCW Monday Nitro show in the Scope in Norfolk, Virginia. For the first time since June 17, 1996, Raw won over WCW's Monday Nitro in the ratings. May 11, 1998: – D-Generation X actually invades WCW headquarters. June 28, 1998 – At the 1998 King of the Ring, Mankind loses against The Undertaker in the third Hell in a Cell match. In the opening moments of the match, the Undertaker threw Mankind off the roof of the cage. Later that night, Kane won his first major title from Stone Cold Steve Austin. July 27, 1998 – Triple H and X-Pac face each other for the first time in a Triple Threat Match, against The Rock. October 5, 1998 – On this episode of Raw, Mankind visits an injured Vince McMahon. During this segment, Mankind introduces Mr. Socko, a hand-drawn sock puppet. Mr. Socko became so popular, that it became part of the Mankind gimmick. A few moments later, in another segment, Stone Cold Steve Austin impersonates a doctor and starts attacking McMahon. From this date until Nitro's last episode on March 26, 2001, Raw took the lead in the "ratings war" and was never beaten by Nitro since (except on Oct 26, 1998). November 23, 1998 – After his return, Shawn Michaels turns on D-Generation X and joins Vince McMahon’s Corporation after hitting X-Pac with Sweet Chin Music. December 7, 1998 - The Undertaker has his druids chain Stone Cold Steve Austin to his "Undertaker Symbol" and raised high into the arena in the entranceway. This caused controversy within religious groups because it physically symbolized Austin being crucified. January 4, 1999 – Shawn Michaels turns against The Corporation and rejoins DX. After rejoining DX, the Corporation attacks Michaels, indicating he is definitely out. Later that night, Mankind won his first World Title from The Rock. March 28, 1999 – The Undertaker defeats Big Boss Man in the fifth Hell in a Cell match at WrestleMania XV, making Boss Man the eighth opponent whom Taker beaten at the pay-per-view event. After the match, Taker (kayfabe) hung Boss Man from the cell. It is also the same WrestleMania that Triple H turns against X-Pac and joins The Corporation. May 23, 1999 – At the 1999 WWF Over the Edge event, Owen Hart, who was going under the name The Blue Blazer against The Godfather for the IC Title, Owen fell to his death when he was lowering himself from the rafters, but released himself too early. WWF was criticized for going on with the show, even after then-Raw announcer Jim Ross had said that Owen died. July 25, 1999 – X-Pac and Road Dogg defeat Chyna and Billy Gunn for the rights of D-Generation X.
August 9, 1999 - "Y2J" Chris Jericho makes his first WWF appearance. September 23, 1999 – Road Dogg and Billy Gunn reform the New Age Outlaws to win the WWF Tag Team titles from the Rock 'n' Sock Connection. September 27, 1999 – In this episode of Raw, Mankind hosted the famous This is Your Life segment, for The Rock. This segment alone garnered the highest rating for any professional wrestling segment on television (8.4) to date. November 1999 – August 2000: Triple H left DX when he "married" Stephanie McMahon, Billy Gunn was soon kicked out, and Road Dogg and X-Pac soon split up after a brief time as a tag team. March 26, 2001 - Vince McMahon announces to the world on Monday Night Raw that he has acquired WCW. Later in the night during a live Raw/Nitro simulcast, Shane McMahon appeared on WCW Monday Nitro and (kayfabe) announced that it was he who had in fact purchased WCW and also voiced his intentions to go into competition against his father. April 1, 2001 – The Undertaker beats Triple H at WrestleMania X-Seven, making him the ninth opponent Taker had beaten at WrestleMania. Stone Cold Steve Austin turned heel by defeating The Rock with the help of Vince McMahon. This event is considered by many to be the last day of the Attitude Era. ↑ Holland, Hulk (7 December 2011). "On this date in WWF history: The Undertaker crucifies Stone Cold Steve Austin on Monday Night RAW". Cageside Seats. Vox Media. Retrieved 29 April 2016. This page was last changed on 29 April 2016, at 22:12.